Taro is a tropical plant popular for its edible corm (underground plant stem) and leaves. Taro is a staple food in Hawaii, and a festival is held every year for this vegetable. Taro can be toxic when eaten raw, this is because of the calcium oxalate contained in the Taro which can irritate the mucus membrane. Which is why taro should be completely cooked to prevent any reaction. Taro plants have large, green leaves that have be said to hold a shape like an elephant's ear. It grows up to a few feet off the ground, and the leaves are individual. The root is firm, brownish-red, and hairy, and has the diameter of a few inches. Beverage complements: Sangria, Juice, Water, Anything really. 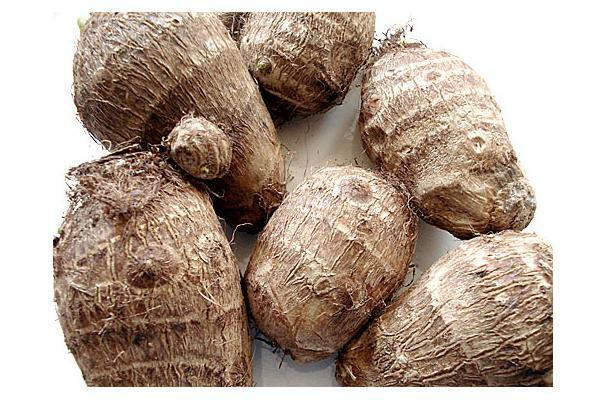 Choosing: When purchasing a taro root, look for one that is good in size and has no blemishes or bruises. Buying: Since these are somewhat difficult to find, there is not usually a wide range of brands to choose from. They can be found in exotic food areas of some grocery stores, or in specialty Asian food markets. Procuring: These grow well in warmer climates, not in Europe or North America. They grow all year round, but are usually harvested in late fall. The taro root MUST be either cooked thoroughly, or soaked in cold water overnight or it will be toxic. Cleaning: Before eating, you must remove the skin, but be careful because some people will have an allergic reaction to the juices that are released when it is peeled. These can be dried, or frozen, but are most delicious when they are eaten immediately after being prepared. History: These roots have been cultivated since 5000 B.C. in tropical India. Contrary to the statement that taro cannot be grown in Europe, I'd like to suggest that indeed it is. Known as the inhame (there's an accent mark in there somewhere), it grows very well on the island of Sao Miguel (St. Michael) in the Azores, islands that are part of Portugal. I'd be happy to send you a photo of the plant that I took a few weeks ago, if you'd like.